London's Regent Street is the first location for a boutique café that fuses a "traditional style" with a "high tech" feel after a partnership between coffee chain Illy and Samsung. The partnership will see Samsung Galaxy tablets and other smart devices installed in Illy’s cafes as the two brands attempt to create a new retail concept where "the physical and digital experiences have no boundaries. 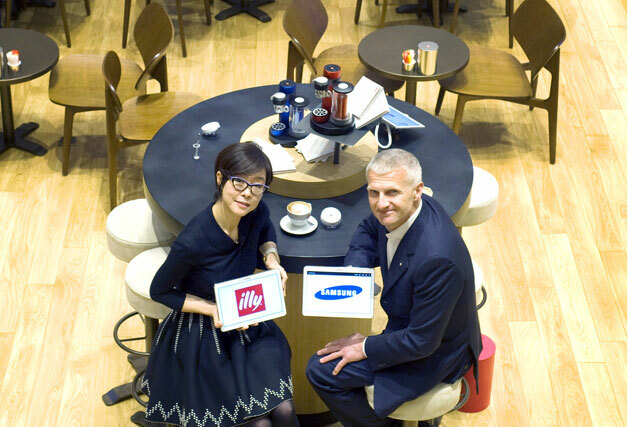 Clients: Younghee Lee, executive vice president of global makreting, IT and mobile division at Samsung Electronics, and Andrea Illy, chairman and chief executive at illycaffè.